If you've ever walked on a beach after a sand castle building competition or seen photos of the finished products, you'd have to agree the structures are pretty impressive accomplishments. 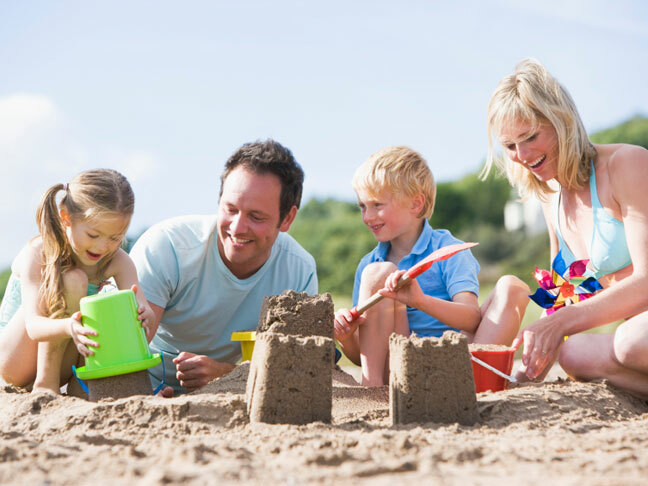 Since children of all ages can enjoy working with the sand and creating elaborate pieces of art, building sandcastles can be a great family activity. Even if you don't live near a beach, if you have a sandbox at home, you can still enjoy this family, friendly activity. If you're building your castle at the beach, be sure to choose a spot close to the water, but not so close that you'll lose your castle when the tide comes in. You'll want to be close enough so you can easily carry buckets of water to where you're building. If you're building at home, be sure your sandbox has at least 10 inches of sand in it and consider hooking up a hose for easy access to water. If you are at the beach, you'll want to dig a hole until you reach the wet sand (using a garden shovel can make this process faster), also called digging to the water table. This is important because the key to getting any structure to stay without crumbling is using compacted, wet sand. Kids can fill buckets with wet sand, pack them down and flip them over to make the most basic tower structures. Older kids may be able to learn the art of handstacking, which consists of pulling the wet sand from the hole towards you, using that as a base and forming pancakes made from the wet sand. The pancakes shouldn't be patted flat, but instead gently molded into the shape of a pancake by jiggling your hands back and forth. The pancakes are then stacked on top of each other to create towers. Using your forearms and hands, you can pull sand together to form brick shaped walls to connect the towers. If your sand structure starts to get dry while you're working on it, add more water by misting it with your spray bottle. Add the finishing touches by using plastic utensils, spatulas and straws to create designs or carve out other decorative elements. For families who really want to get competitive and create castles like they've seen the pros sculpt, you can take even classes. Visit Sand Castle Central for more sand castle building tips and tricks and to find a sand sculpting instructor near you.